A few months back, renowned British comics artist, Simon Bisley, created a poster for Neil Marshall's Centurion featuring the filmâ€™s main characters played by Michael Fassbender and Olga Kurylenko. 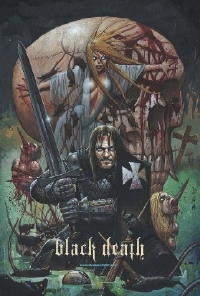 Well now, Magnet have released two posters that Bisley did for Christopher Smith's Black Death (on VOD now) and I think they're even cooler. This is the second time Bisley has created a piece of art for a motion picture. He is best known for his 1990s work on ABC Warriors, Lobo and SlÃ¡ine; his style, reliant on paints, acrylics, inks and multiple mediums, and takes inspiration from rock album covers and graffiti, as well as traditional comics art. Good posters. Shamefully bad film. I mean, really, really awful. Traingle was clearly a fluke. Chris Smith returned to his bland self for this flick.